This is a newer unit with 2 folding sofas, 2 rear motorized beds, and a front bedroom with a walk-around queen. It features a hallway for the bathroom entry and bedroom entry, with a secondary private bathroom door between the bathroom and the bedroom. 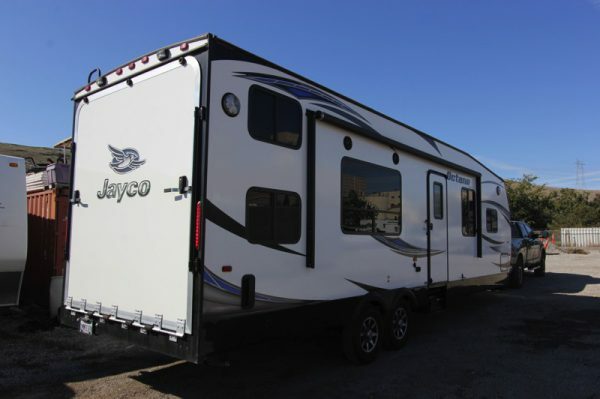 The unit features nice features such as fiberglass siding, electric awning, and 12v TVs with DVD players in both the living area and the front bedroom. Front private bedroom with walk-around RV Queen bed. Side Bathroom w/ walk-past hallway & door to master bedroom. 2 @ Side couches (folds into bed) – Sleeps 8-10. Electric Awning, Storage, Ducted A/C, Heat, Fan. 102 Gal Fresh, 45 Gal Gray, & 45 Gal Black. 23 Gal Fuel Station.